media storm, dropped out of sight 20 years ago and - until now - has never spoken publicly. Her appearance January on the Dr. Phil show and in People magazine to discuss her book is the first time she has ever spoken publicly. Katie is also expected to be featured on the cover of Newsday, the daily newspaper serving 3 million Long Islanders. The telling of her story, upon the 20th anniversary of her rescue (January 13th) offers enlightening hindsight into what enabled Katie to overcome a lost childhood. The book includes never-before told details of her ordeal and the shocking discovery of audio tapes recorded by her kidnapper during the captivity. Katie Beers is a married mother of two, currently working in a family-run insurance business. As a profoundly neglected and abused child, she was kidnapped and locked in an underground coffin-like box for 17 days. 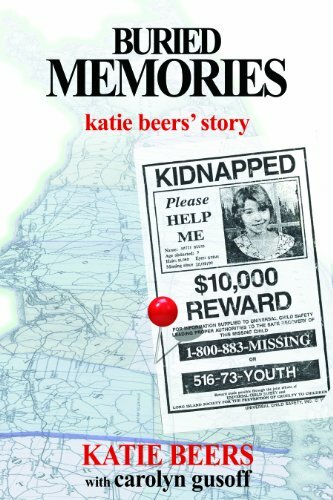 The kidnapping of Katie Beers made worldwide headlines in late 1992. Katie, at the center of a national media storm, dropped out of sight 20 years ago. Katie has a Bachelor's degree in accounting and lives in rural Pennsylvania with her husband and their two children. Carolyn Gusoff is an Emmy award winning broadcast journalist currently working the Long Island beat for WCBS-TV. She has covered some of the most high profile news stories in New York City. Prior to WCBS, she reported live daily for Good Day New York, Fox5 WNYW for 3 years, and was Long Island Bureau Chief at WNBC for 15 years, also co-anchoring Weekend Today in New York.A graduate of Columbia University and Cornell, she was born in NYC and lives on Long Island with her husband and two children.